At To An Fro we offer a wide selection of transport solutions for you to find the perfect vehicle for your needs. We offer a comprehensive range of vehicles including cars, vans, lorries, and minibuses. 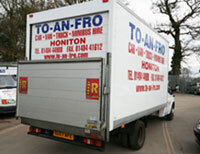 To An Fro offer a fantastic choice of trucks to choose from, including tail lift lorry hire. A tail lift lorry has a mechanism attached to the back of the lorry to assist you in loading items onto the truck. 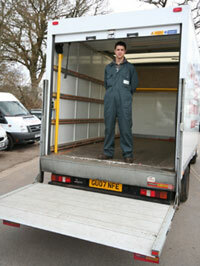 The tail lift is ideal for if you are moving heavy items including heavy machinery and furniture. By using a tail lift lorry from To An Fro you can save yourself money with our competitive and affordable prices. In addition, with a tail lift you are also able to remove the necessity of additional help or machinery, including the need of a forklift truck. If you want to find out more contact us and our friendly team will be able to answer any of your questions about our vehicles.